A few 2015 predictions no doubt swiftly to be proven wrong. Ukraine is an endless source of fun. The play-thing of a Mad God and yet safely removed from the possibility of further Western Adventures. But, perhaps this time Putin has overplayed his hand, forcing a response that Russia’s petro-export economy can ill afford. The Entente 2010 – What does it mean & whither will it lead? France and Britain have concluded a set of new Defence agreements that will see the countries work more closely together, but what will be the result? The countries share a great number of complimentary & similar characteristics including GDP, Defence budgets, UNSC membership, nuclear deterrents, overseas dependencies & global foreign policy ambitions, but both have defined their ambitions through opposing reactions to the Suez crisis. In both instances to never find themselves marginalised in world affairs through opposition from the US, but on the one hand by by converging already complimentary ambitions, and on the other by creating a european framework through which independence of the US can be achieved. What does this agreement tell us about how those ambitions have evolved since the Cold War? This article has been steadily brewing for some time, but its arrival has been hastened by the thoughts of a Think Defence article; Political Statement of Interest and Intent? 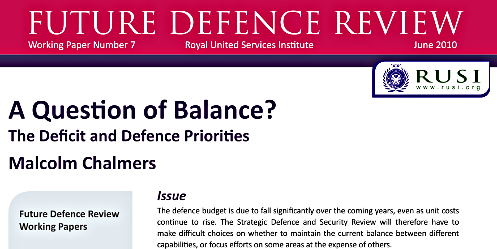 It stems from the apparent internecine war between the Service Chiefs in the run up to the looming Defence cuts, and the alleged failure to consider first-principles and desired outcomes when formulating the SDSR. This debate appears to revolve around the fading relevance of Single service tasks, and where the focus should settle in this new world of ‘jointery’.